Brit Matthew Parry recorded the best time in Free Practice for Round 4 of the GP3 Series season. The Koiranen GP driver’s quickest laptime was 0.027s quicker than ART Grand Prix’s Nirei Fukuzumi. Fresh from his Haas F1 Team FP1 duties this morning; Charles Leclerc was third. The forty-five minute session was run in hot conditions as the 23 drivers ventured onto the Hungaroring eager to be back in business. Arden International’s Jake Dennis set the early pace and bettered his personal best to increase his advantage at the front to four tenths. New GP3 winner Antonio Fuoco from Trident found some extra pace to go P1, albeit only briefly as DAMS’ rookie Jake Hughes shot to the top spot by half a second. Artur Janosz displaced his teammate to go second, before Jenzer Motorsport’s Arjun Maini lapped three tenths off Hughes to move into P2. Hughes increased his margin over his rivals with his DAMS teammate Santino Ferrucci rising to second. However, Parry was the next man on the move as he clocked a laptime of 1:33.484 to take control of the timesheet. Fukuzumi responded and went quickest with Leclerc hot on his tails. Meanwhile Ferrari Driver Academy’s Fuoco was up to third until Leclerc demoted the Italian to fourth in the final moments. Parry still had more in his pocket as he brought his Koiranen GP machine over the line to head back into P1 and top the session at the chequered flag. 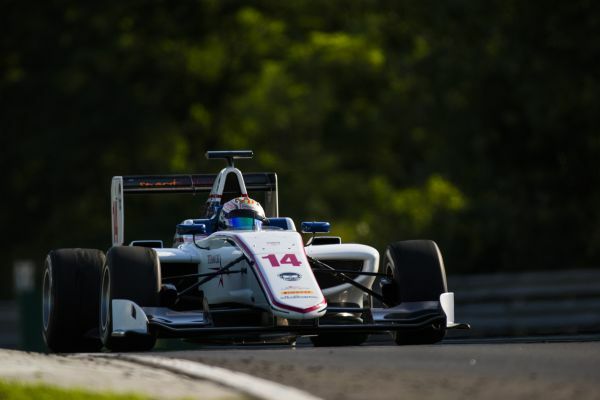 Fukuzumi, Leclerc, Fuoco, Matevos Isaakyan, Alex Albon, Hughes, Nyck de Vries, Dennis and Maini completed the top ten. Qualifying takes place tomorrow at 09.45 local time (GMT+2).